Gerald Tritt wants you to stop FLIPPING! In this episode of Top 4 Barbecue Blunders, Vera’s Burger Shack Co-owner, Gerald Tritt explains barbecue blunder #3 – Flipper the Clown: Your spatula is for turning burgers, NOT for flipping them every 20 seconds. Over-flipping will take the juice out of your burger and cause your patty to disintegrate on the grill. 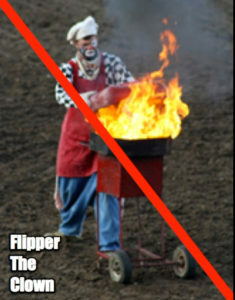 Don’t be “Flipper the Clown”. Share your barbecue tips in the comments below! For more information on purchasing 6-packs of Vera’s tasty fresh handmade burgers for you to grill at home, visit our website and our Facebook page. Your dad is a smart man! I love seasoning my patty with sea salt! Thanks for the comments, I typically season my Burgers by mixing the seasoning into the meat. I know that goes against the don’t over work the meat theory, but as I like using a char broiler, the surface seasoning can have a tendency to fall off. Further we use a different spice mix, when we have tried to flat top it with our spice mix, it tends to clump. I didn’t know the onion trick to clean the grill. Such a great idea! I think that’s a good point for steaks, but I always grill my burgers from cold. If I ever was guilty of flipping burgers too much, this video has taught me not to do that! Thanks! Thanks, hopefully the tips will make for an awesome BBQ this summer season! Definitely know a couple of clowns! We end up with “ground beef” and make tacos! Tacos are good to but…..
Great Video Series – helps me resist the temptation to flip and smoosh down. Burgers last week were mucho betterino! Use a thermometer to get the meat to cook exactly how you like It.